Boy, what a week it's been. Sorry I haven't traipsed around these here parts lately, but things got a bit crazy for me. First of all, thank you for your comments and for checking out my John Canemaker interview from last week (read Part 1 and Part 2, if you haven't already). It was a labor of love and I'm very glad to have shared with you all my conversation with Mr. Canemaker. I needed a break after that, hence the lull in posting. It's been an interesting past two weeks. I never in my life would've thought that my 1962 Fallout Shelter Handbook would generate so much interest from around the internet. It's become my second most visited post, behind my famous rant on THE POLAR EXPRESS zombie kids. Over 10,000 hits on the day it was mentioned on Boing Boing! Unbelievable. Big thanks to Mark Frauenfelder for posting it -- it's nice to know that he reads my blog (I didn't even submit the link). I'm quite honored, actually. Perhaps I'll do a follow up with more scans from the handbook. I even had a guy offer to host a pdf of all the images. Once I find the time to do so, I'll be sure to post about it. Funny thing: one of the more interesting things to come from the wake of that post is that it's been linked on several Russian sites, with one blogger offering one simple quote: "No comment." So yes, yes...I've been busy. Busy with Primal work as well as the work I do at home. The latter part has been building recently and it usually follows the same pattern each holiday season. No matter how hard I try and avoid it, the work piles on. I'm sorry if it takes me longer to reply to emails, just be patient and I'll try to get back to you when I can. I'll try and work you in between work, family, as well as all my Christmas shopping that I've yet to tackle. Yipee! 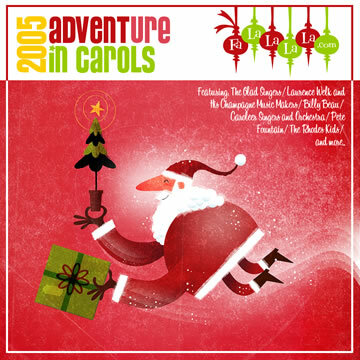 One side project I'm excited about working on is illustrating the cover to Brad "King of Jingaling" McLeod's ADVENTure in Carols, a yearly compilation of Christmas music that's featured on his site, Falalalala.com. Brad asked me to do the cover last year, but I was too busy (big surprise) -- I felt terrible that I couldn't do it, but he was able to nab the illustrious Steve Mack (see image at right) to create something fun and Christmas-y. The Mack is a hard act to follow, but I'll do my best. Sorry, no sneaky peeks, kiddos. I won't post the cover until the album is available to download later on this month. In case you're wondering, the compilation consists of interesting and intriguing Christmas songs that have basically fallen through the cracks of time, from Mr. Jingaling's own collection. I think the site's tagline sums it up pretty nicely: "Preserving the Memories of Christmas Vinyl Past." This will be the third ADVENTure -- check out the two previous efforts HERE. 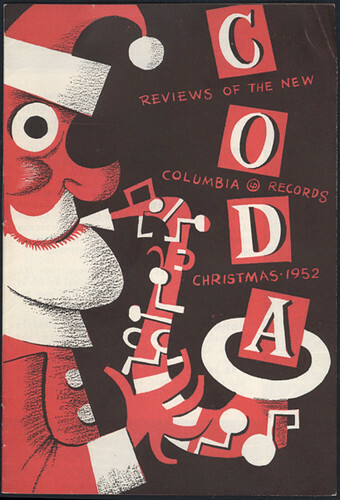 Be sure to also check out Brad's great collection of Christmas album covers on his Flickr. And if you like more of that sort of stuff, there's a Flickr group made just for you: Vintage Christmas: 1945-1970. In case you're wondering, that's a Jim Flora illustration at the top of the post there, done for CODA, a monthly publication that Columbia Records would send out to subscribers about new releases. Flora did all the artwork for the publication in the early 50's. The scan is courtesy of Irwin Chusid, Flora's biographer, who wrote about Flora's career on Leif Peng's fantastic Today's Inspiration several months back. Speaking of Jim Flora, I recently posted about him on Drawn!, mentioning that the estate of the late great artist is offering a limited edition run of high quality silk screened prints of Flora's famous 1955 cover "Mambo for Cats." If you want to read more about it then by all means click HERE. Be sure to visit the official Jim Flora Art store on eBay while you're at it. And lastly, if you dig Flora's crazy shapes and imagery, then join the official Jim Flora Art Flickr group. If you have any of his original album covers, scan and post 'em. We'd love to see 'em all! Ward sent me some rough sketch ideas, so even I haven't seen what's going through his wonderfully creative little brain. I'm like a kid waiting for Santa at Christmas. I'm sure it'll be just the right image! OMIGOD...a post on Jim Flora!? You know I dig this. I'm gonna check out all those links. Thanks! And you KNOW I want one of those Mambo Cats tshirts...I might break down and do a little selfish Christmas gifting for myself. Also, congrats on the ADVENTure in Carols assignment. I sure hope you plan on posting your final piece...I'd love to see it.